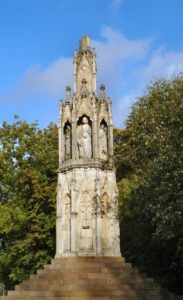 In the first of a series of posts on commemoration, MALMECC’s art historian Laura Slater looks at the phenomenon of the ‘Eleanor Crosses’ – a very visible memorial to Eleanor of Castile. One example of a happy royal marriage was the union between Edward I of England and Eleanor of Castile. Eleanor accompanied her husband on crusade in 1270, and gave birth to her fifth child while staying in Acre, a daughter named Joan. In 1272 in Acre, Edward was attacked by an assassin with a poisoned knife. Surgery was required to remove it- a drastic step in a world without anaesthetics and with little means of preventing infection. The contemporary chronicler Walter of Guisborough records that Eleanor was led from Edward’s bedside before the operation, weeping and lamenting. Later legends suggested that Eleanor herself sucked the poison from her husband’s wound. Even in an age of pragmatic aristocratic alliances, people still liked the idea of a fairy-tale royal romance, followed by a loving and happy marriage. When Eleanor died in 1290, a grief-stricken Edward I ordered that twelve monumental crosses mark the places where her funeral cortege rested each night, as it travelled down from the village of Harby in Nottinghamshire, where Eleanor died on the 28th November, to her final resting place at Westminster. 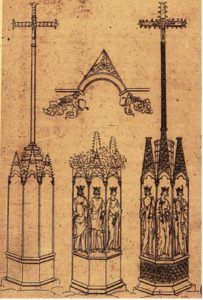 In another reminder of the internationalism of late medieval courtly culture, the crosses echoed the royal ‘montjoies’ of France: a series of sculpted crosses set up between Paris and the abbey of St Denis to mark the route of King Louis IX’s funerary procession. All French monarchs were laid to rest at St Denis, and by the later thirteenth century, Westminster Abbey was becoming a similar royal mausoleum for the Plantagenets. 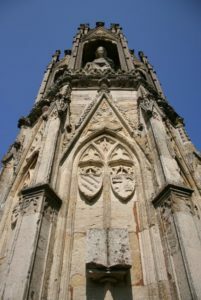 The surviving Eleanor crosses display numerous statues of the queen, shown in idealised and youthful form. Her hair is loose, just as it would have appeared at Eleanor’s coronation. 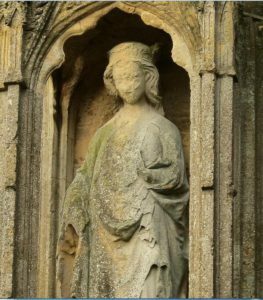 The statues of the queen strongly resemble contemporary images of the Virgin Mary, deliberately drawing parallels between the dead queen and the tender, beloved mother of Christ. 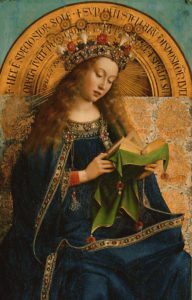 In contrast to vengeful saints like St Cuthbert of Durham, the Virgin Mary was venerated as a loving and forgiving intercessor- a caring mother whose spiritual grace could always be relied upon, no matter what your sins. Decorated with an array of royal heraldry, the crosses form a lavish display of royal splendour. They also had a devotional function. Open books can be seen on some of the crosses. Originally, they were probably painted with requests for prayers. People passing the cross would have been encouraged to look up, see the beautiful figure of the English queen (who looked just like the Queen of Heaven) and then pray for her soul. As well as a token of Edward I’s deep and genuine grief, the Eleanor Crosses may also have become part of (a perhaps unwitting?) 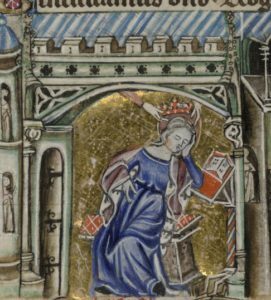 royal PR effort- for as the later legends of Eleanor’s heroics in Acre show, she was ultimately remembered as a loving queen.